Car accidents are the leading cause of catastrophic injuries and death in South Florida. Whenever you are involved in a car accident or any other personal injury scenario, it is best to seek an experienced Miami Car accident attorney to handle your situation and provide the most suitable legal remedies on your behalf. Gallardo law Firm specializes in cases involving vehicle accidents, motorcycle crashes, bicycle accidents, truck accidents, uninsured drivers, Uber accidents, and many other current traffic accident fatalities. For decades, our attorneys have aggressively represented car accident victims in every possible vehicle crash scenario, and we will do the same for you. A Miami Car accident attorney has an excellent perspective of personal injury laws and how they may apply to your specific circumstances. Your attorney will strive to obtain the maximum compensation possible. Auto insurance companies will try to negotiate a settlement for you. But sometimes these negotiations will be entered at a disadvantage. You may accept an offer that you believe is very good, but it’s possible that you may deserve much more. It is essential to consult a Miami Car accident attorney from Gallardo Law Firm before talking about the accident to anyone. Hiring one of our attorneys will place you in the best position to succeed. In this article, you will learn about the ins and outs of auto accidents, from what to do after a crash to who’s responsible for the harms suffered, to filing a car accident lawsuit, a Miami car accident attorney will handle your car accident compensation claims most effectively. Out of six crashes in Florida, one or more take place in Miami. An average of 50,000 accidents every year occurs in the Miami area – 4,000 a month. Over 20% of Miami Dade County auto accidents happen in the city of Miami. Auto accidents may cause a variety of injuries and medical conditions. The most common auto accident claims involve injuries to the neck, back, and spine. Some car accident injuries need prompt medical attention and surgical repair, which can be very costly. Cases that comprise DUI, pedestrian, and motorcycle accidents may cause paralysis, traumatic brain injury, and even death. Rear End Collisions: These are the most common types of motor vehicle accidents. Head-on Collisions: This is one of the leading causes of death and injury in the state of Florida. Distracted Driving: Many fatal accidents involve distracted driving. Cell phones are among the main causes leading to these types of accidents. DUI Accidents: Driving under the influence is one of the leading causes of fatalities and severe injuries, which can be preventable. Hit and Run Accidents: This generally happens when there is no car insurance; the person is intoxicated, or guilty of committing another crime. Truck Accidents: Truck and commercial vehicles are very common in South Florida, and therefore these types of accidents are inevitable. Motorcycle Accidents: These types of accidents often pose difficult factual, legal and economic issues. Side Impact Collisions: These collisions generally cause more severe physical injuries when compared with other kinds of accidents. Bicycle and Pedestrian Accidents: These accidents are less common; however, Miami is one of the most unsafe cities for walking in the whole nation. Likewise, bicycles are used for recreational purposes. Why choose a Miami car accident attorney from Gallardo Law Firm? At Gallardo Law Firm, we are very familiar with many of these unfortunate incidents, and we have handled them successfully on behalf of our clients so they can find physical, emotional, and financial stability for their adverse circumstances. We have dealt with a variety of complex cases where the negligent actions of one or multiple parties caused the traffic accident and fatal car accident injuries. It is difficult to find the individual or entity financially responsible for the damages incurred, except when you hire a capable car accident attorney. Financial compensation can come from many sources, including corporations, employers, and even independent contractors. 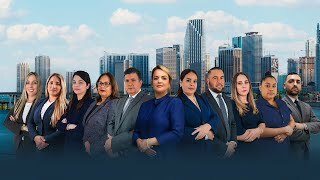 But you must gather adequate evidence to support your case in court, a difficult task to accomplish without a Miami accident attorney by your side. Every driver should drive in a way that will not put other drivers, pedestrians, cyclists, and road workers at risk. Even when the conduct was not intentional, the negligent party is always responsible. Cases involving distracting driving such as speeding, driving under the influence, texting behind the wheel, and not following traffic signals, can be won in court as long as you can prove them with the help of an accident attorney Miami FL. To determine who is at fault in a collision, an auto injury accident lawyer will analyze each driver’s behavior carefully. Once your attorney knows what person has acted carelessly or negligently, he will proceed to study the applicable laws and see if the negligent driver broke any rules that will make him or her liable for the crash. In Florida, we have comparative negligence, which means more than one party can be negligent. This legal defense can affect the injury victims significantly since they may not be able to get all the compensation they need to finish their recovery successfully. That’s why it is so crucial hiring a Miami car accident attorney to represent you. At Gallardo Law Firm we have the resources to fight these unjust defenses. Victims of auto accidents and their families should learn about the statute of limitations for filing a lawsuit in Florida; otherwise, they may not have a chance to file their car accident claim in a timely manner. Depending on who is at fault, and the background of the negligent party, victims can file a car accident lawsuit but only within the time limit. Statutes of limitations can vary for every car accident injuries claim. For example, auto accidents triggered by a defective vehicle have a different statute of limitations from a collision involving a careless driver. Also, sometimes the vehicles are owned or operated by either individuals or local establishments and their employees, which have different schedules or hours of operation, and your case may take longer than expected. Knowing the statute of limitations for your specific situation can help you avoid these pitfalls, so your car accident injuries claim is handled effectively. When you are involved in a traffic accident, and you sustain severe injuries, you are entitled to recover financial compensation, commonly known as damages, for past and future medical expenses. You may also receive compensation for lost wages, loss of support and earning capacity, unable to lead a normal life, scarring, and disfigurement. Family members and injured victims can also receive compensation for pain and suffering, which may include emotional and psychological harms. At Gallardo law Firm, we understand catastrophic car accident injuries can change your life forever. A Miami accident attorney knows the best legal approach to handle life-altering injuries such as spinal cord injuries, burns, and brain trauma. We want you to focus on your medical, work-related, and social recovery while we face these legal challenges for you. Assess the damage and call for help – Pull your car to the side of the road or safe location nearby and check out if anybody is injured. If that’s the case, seek immediate medical care. Call the police - Notify the police so they can fill out an accident report and document the scene. Exchange of information - Get the contact information of people involved in the crash, their insurance company and policy number, driver’s license, license plate number, car specifications, and location of the accident. Don’t argue, get the facts. Document the accident – Take pictures or video and document key details such as road debris and property damage. Obtain names of witnesses and a written statement. Send that information to us by e-mail at info@gallardolawyers.com, or you can chat, call, and visit us to schedule a free case review. Notify your insurer – You must get in touch with your insurance company within 72 hours of the accident. If your case involves significant injuries, it is best you hire an experienced Miami car accident attorney. Car accidents can leave victims with catastrophic injuries and damage to their property. With the help of a Miami car accident attorney, you can recover compensation under Florida law by filing a car accident lawsuit. Your attorney can help you establish that the traffic accident was someone else’s negligence. Establishing negligence on your own can be a complicated process. If liability is contested, your attorney can investigate the events that led to the accident and gather the necessary evidence. Also, if you admit fault unintentionally, an auto injury accident lawyer can deal with your insurer and make sure they don’t withhold the compensation you are entitled to receive. Gallardo Law Firm has a lot of experience handling car accident compensation claims in South Florida. Our attorneys have a history of success, and they are always ready to help no matter how complex your car accident claim might be. You can e-mail or call us today. Hiring one of our attorneys is a crucial step to protecting your legal rights. Se habla Español. What information do I need to gather at the scene of the accident? The following information will help your attorney prepare your case: 1- Names, addresses and telephone numbers of witnesses and those involved in the collision. 2- The make and model of the automobiles involved in the crash. 3- The other motorist’s driver license number. 4- The other drivers’ auto insurance information. 5- Police report number or the name of the reporting officer. 6- Photographs of the damaged automobiles. What if I was not wearing my seatbelt? Depending on the state where the accident happened, you could be denied any potential reward or compensation for the damages sustained in the accident. Will I have to go to court if I file a personal claim? Your case will not go to court if the other drivers’ car insurance agrees to pay the amount that your lawyer said your potential compensation is worth. Should I let the insurance handle it or should I handle it myself? Seeing how every car accident is different, it is essential to hire an attorney for an extreme case. Do I see a doctor after an automobile accident? It is always recommended to visit a doctor after an accident has occurred. Yes. Do this immediately. You may have to visit the emergency room in the beginning. If you need to see a specialist, your personal injury attorney will assist you. When should I contact my insurance agent? Call your insurance agent at your earliest convenience even if you are sure that the other motorist caused the collision. However, it would be advantageous for you to allow your personal injury attorney to file the claim on your behalf. Then, you will not have to be concerned that you will say or do something that will jeopardize your case. You will not necessarily have to go to court over this matter. Your case may be more valuable if your car accident lawyer tries to negotiate an out-of-court settlement. When this cannot be accomplished, you may decide to file a lawsuit via a car accident lawyer Miami. How can I help my lawyer develop a strong case? Refrain from talking to anyone from the auto insurance company. Your car accident lawyer will do all of the communicating for you, so you do not have to do this. You can speak to your lawyers, of course, and your doctors. Make sure that you follow all of their instructions. What if I think that I am partially at fault? If you believe that you contributed to the collision, you don’t have to tell anyone. It will be your lawyer’s job to investigate the occurrences and determine who is at fault. If you need to take partial responsibility, your lawyers will let you know. The insurance company asked for a recorded statement? Should I Give It To Them? No. You must not allow yourself to be recorded while discussing the collision. What should I tell the insurance adjuster if he contacts me? Inform the insurance adjuster that you hired car accident lawyer and for them to call your lawyer from now on regarding the accident. Should I sign medical authorization forms for the insurance company? No. Do not sign any documents for the insurance company. Your car accident lawyer will handle this for you as well. How much money will a jury award me? Your car accident lawyer can answer this question only after they have thoroughly investigated the case. The answer will depend on the number of your medical bills and the severity of your injuries. They must also know exactly the circumstances under which you came to be injured. Once they have the necessary data, they will place a dollar amount on the case. You may do so if you wish, but you may regret that decision in the end. The insurance company’s adjusters and lawyers do not want to offer you a fair settlement. Furthermore, you are not aware of all of the intricacies of personal injury law. You could unwittingly say or do something that will damage your case. Allow professionals who have experience in this area of the law, such as a car accident lawyer, to do this work for you.